Notes: Focus on good depth and quality position. If you do not have a front rack position, either keep the weight light and focus on improving your position, or perform High Bar Back Squat to better depth. Do not reinforce poor positioning! Notes: Focus on depth, positioning and using that bounce out of the bottom! Notes: Focus on quality for the pullups and sub a hard version of ring rows as needed as opposed to using a band. For the step ups, hold two kettlebells in the front rack position, use dumbbells and lower the height of the box as needed. 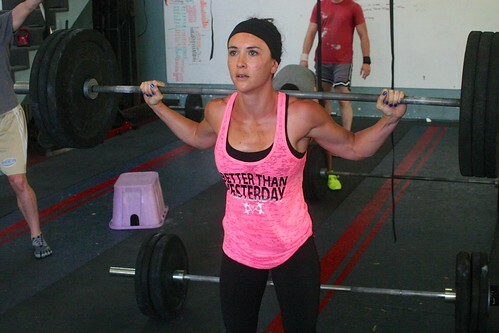 Unfortunately due to the recent circumstances/events, this is not your typical CrossFit post. I live very close to Santa Monica College. When I came home tonight, Lindsay told me the chilling details of the shootings that took place so close to home. I became instantly sick to my stomach. To think that there are so many sick people out there looking to do harm to others is very disturbing. It gives us a harsh reality that those type of people are out there, all over the place, from Colorado, to Newtown, to Boston, and now even in our own backyards. We have to increase our awareness of our situations & surroundings at all times. One of my coworkers was a freshman in high school at Columbine during the shootings about 15 years ago. Hearing the story from someone who was actually there witnessing the unthinkable is absolutely terrifying. He was sitting in the cafeteria having lunch when the massacre began. Due to his quick thinking and ability to sprint like hell out of there, he was able to escape without any harm. Unfortunately he cannot say the same about some of his friends and teachers. The point is that I think that although these situations are rare, they can happen to any of us at any given time. So to better prevent these unfortunate situations from affecting you & your loved ones, you must always be aware of your surroundings. Its very easy for us to put our everyday tasks on cruise control, but doing so can get you into a compromising situation. We must constantly stay on our toes and pay attention to our intuition. We don’t always think about Crossfit preparing us for life and death circumstances, but the skills, strength, endurance & mental toughness that we develop can help us “perform”, if you will, better than the average person in many real-life situations. We can run fast, jump high, climb & lift heavy objects. These skills can greatly increase our chances for survival and our ability to assist others in dangerous situations. So the next time you are feeling unmotivated, put this into perspective and it just may give you a little extra incentive to wake up and get moving.